When you find a letter you like, tweak to fit for your child, don’t copy word for word. Also make sure to include (depending upon the age) information on the communication book. If you have a child with a communication impairment you know you are probably their best translator. It’s frightening for both you and your child to be separated on those first days of school, but there are things you can do to make that transition easier. One of them is writing a letter to your child’s new teacher so they have a better understanding of one of the precious new students they’ll have in their class this year. This year you’ll be having my very special child in your class. When you look at my child, you will see eyes that light up and are full of life. He looks like the other children in your classroom. But my child has lived with a lot of silence and a great struggle to communicate. My child has verbal apraxia. Verbal apraxia is a speech disorder that is both difficult to diagnose and challenging to treat. Those with apraxia know what they want to say the words are in their heads but often are not able to produce the words clearly. For unknown reasons, individuals with apraxia have great difficulty planning and producing the precise, highly refined and specific series of movements of the tongue, lips, jaw and palate that are necessary for intelligible speech. As one expert has said, The problem occurs when the brain tries to tell the muscles what to do — somehow that message gets scrambled. It’s like trying to watch cable TV stations without the right descrambler. There is nothing wrong with the TV station, and nothing wrong with your set. It’s just that your set can’t read the signal that the station is sending out. The child’s language- learning task is to figure out how to somehow unscramble the mixed message his brain is sending to his muscles. Those with apraxia do understand language and speech. Apraxia in itself is not a cognitive or receptive disorder. However, especially in children, others might mistake and misjudge unclear speech or quietness as a lack of understanding, or worse cognitive deficits. Many children with apraxia experience a great sense of failure and frustration in their attempts to communicate. Some children grow even quieter; others may act out their frustration. Children with apraxia need the support of teachers and parents. A speech-language pathologist (SLP) needs to help my child learn to speak with more ease and clarity. It will help my child if you communicate frequently with the SLP and determine if there are things that you can do in the classroom to help my child communicate and practice speech. Try to create a tension-free and interesting “communication environment” for my child. Encourage but do not insist he try to speak. Praise his attempts at speech, if only for effort. Please know that sometimes my child might not respond or might respond “I don’t know” as a way to help himself get out of a difficult communication challenge. Be patient. Sometimes the fast pace of others can leave my child out of the experience although he may be able to successfully communicate if others just offer a bit more time and patience. Watch for and even create opportunities to help my child make friends. It can be difficult for a child with apraxia to “break into” social communication and situations. A supportive and nurturing teacher can surely help. No child should be lonely and all children need a friend. Intervene immediately in any situations that involve bullying or teasing. Reassure my child that you are his supporter and advocate and that no teasing is acceptable. Be aware that sometimes children with apraxia are also physically uncoordinated, making competitive sports or even drawing, cutting, and other motor tasks difficult. If you notice something, please do bring it to my attention so we can work together to help my child. Keep in mind that due to the delay in speech children with apraxia may have developmental lags in reading or writing. That does not mean they have an impairment in these areas, and there are teaching strategies to help them. Be open to alternative ways my child may need to communicate. Often pictures can help my child as a bridge to clear speech, helping us gain insight into his thoughts. Include me as your partner. I want very much to help my child and to do everything possible to help him or her. I hope we will always reach out to communicate and share information with each other for the benefit of my child. 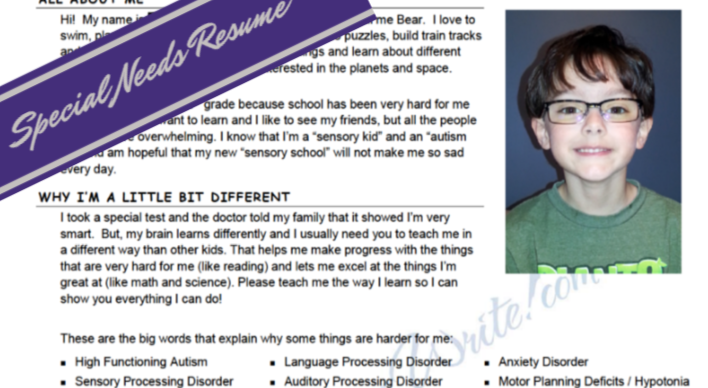 I am a high school special ed teacher and the parent of a 4 year old daughter with apraxia. Teachers need as much parental help as they can get. I appreciate parents who become involved in the learning process and interact with me about testing. If your teachers school has email for the instructors as my school does email can be an easy way to find out just what is each teacher doing with your child. Listening Skills – teacher reads or tells a story and student puts pictures in order to show understanding of sequence of events. Colors and Shapes – student can be given a template with the learned items on them and asked to identify by pointing to show knowledge of color or shape. Math skills can be tested through writing if student has mastered writing numbers. Spelling tests are written not spoken so standard test can be given if student has mastered the written alphabet. “Lisa Geng wrote that I gave the Late Talker book to the SLP at my sons’ school….and with her permission she “autographed” it (read between the lines)…my very good friend with excellent penmanship wrote a beautiful note inside the book (again from Lisa and with her permission) basically saying what a great job she was doing with her friends (who are my twins with apraxia) and that one day when she wrote her next book she would be contacting her to add what terrific methods she had been using to help (my children) her friends speak. Needless to say I am sure by now you know that this particular school SLP is not one that I am especially fond of because she basically knows nothing about apraxia..even with her CCCs after her name….of course, I had to mention what good friends Lisa and her husband Glenn and children Tanner and Dakota are….and basically we all know Lisa through this site anyway, right?? So I wasn’t making anything up and I prayed that the book and thought of Lisa contacting her would help…. Send the letter to the school psychologist, with a copy of the letter sent to the principal. It would not hurt to send a copy to the director of special services but it’s not necessary. The school psychologist is the one who will handle the referral. The principal is just a “courtesy” to keep informed, although in some schools the principal has a fairly active role in sitting in on discussions about students and may be influential in the decision. If the school has a learning specialist or counselor, you could also cc them a copy as well. 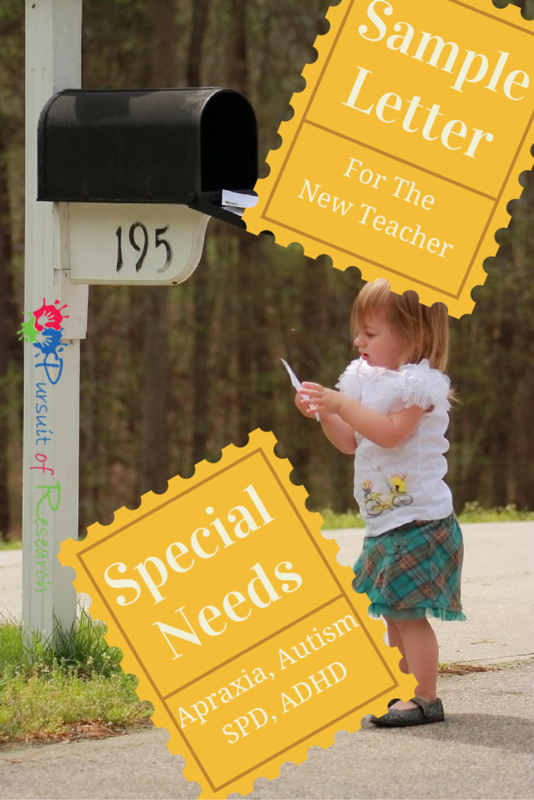 At any rate the letter should state specifically that you are requesting that your child be made a Referral and a Focus of Concern to Special Education for consideration for testing and evaluation. The reason why I say Referral and FOC in capital letters is that the old language used to say Focus of concern, the new language says Referral. It just covers your bases in case the district is nit-picking about words used. Then state the areas that you would like to ask them to consider testing in: social/emotional (behavior), adaptive, cognitive, academic, articulation, receptive language, expressive language, fluency, hearing, fine motor, gross motor, can’t think of the others off the top of my head. List out any diagnoses that your child has IF you would like them to know this information. It’s up to you– that info can be kept private, but it can also be helpful in getting your child qualified for services. List out the ways that your child is impacted educationally and if you know of things that teachers have tried to do to help your child in the classroom, list those out too. One of the caveats of special ed is that they *must* look at LRE. Least Restrictive Environment. That means that if a general ed teacher can do some accommodations that allow the child to be successful, then that’s the LRE. Placement into SpEd is a more restrictive environment and will only be done if some “interventions” have been “tried” and were “unsuccessful”. So list them out like that–here’s some things that have been tried, and they were not successful, or not what the child needs in order to fully participate in the curriculum. If you don’t know of things that have been tried, then leave that entire section out of the letter. Just type out the request for referral/focus of concern, the areas of concern, and any diagnoses if you want them to know. The part about things that have been tried is simply a matter of speeding up the process–it’s not necessary for you to include that in the letter. I’m just saying, if you know it, include it. If you don’t, then don’t let that stop you/delay your writing the letter. The listing out of the interventions is actually something that is the school team’s responsibility to do once they make the referral. Once they type out the referral, they have 25 school days to determine if there’s enough evidence/interventions tried to warrant a decision to test. If not, they’ll say they won’t test. If there are, then they’ll say they’ll test. Sometimes, a school will not bother with that 25 days–they’ll go ahead and fill out the referral and the decision to test form at the same time, and ask you to sign the permission to test form right away. Keep in mind that the timeline starts not on the day you sign it and send it in, but the day they RECEIVE it. So don’t hold onto it too long… and follow up with a phone call in a few days to make sure that the form got back into the school psychologist’s hands. In terms of sensory integration issues– a lot of schools do not honor this as a diagnosis at all. They must “qualify” on fine or gross motor testing and if so, then some districts will incorporate sensory therapy into their objectives but it’s pretty rare to find a school that will write purely sensory objectives onto an IEP. If your doc is willing to provide a medical “catchall” diagnosis like Encephalopathy for his sensory dysfunction, then that may prove useful for getting a Health Impaired or Other Health Impaired label with the school district (and thus, getting the foot in the door to getting services). Otherwise, if he’s in grade K or 1, they’ll probably try for a Developmental Delay label (DD can be used up through age 8 years 11 months and then they must get into another handicapping condition for SpEd services). Do not give it to the school teacher directly– she can have a copy if you want her to, but send the original to the school psychologist. You can hand deliver it to the office and ask that they put it in the school psych’s box. If you do not hear back from the school psych within a week, then call the school and ask to speak to the school psych to make sure they got it. My first move would be to write a letter to the teacher. Keep documentation of EVERYTHING you write and EVERYTHING they send you. Here’s my initial letter. Dr. B, MD and myself have had the opportunity to review your detailed observations of my son, Johnny while he is present in your classroom. Firstly, I would like to remind you that autism is a neurological disorder. Johnny has autism and his behaviors are symptoms of what is going on in his brain at this time. Some of the approaches you have chosen to employ have been questioned by Dr. B,. For example, requiring a 8 year old child with autism to put his head down on his desk is not only unconscionable and outrageous, but described by Dr. B as demeaning. What are the antecedents before the behavior happens? In order to address these issues I will be requesting additional support specifically to complete a functional analysis of his behavior in your classroom. My behavioral philosophy is that people with challenging behaviors need our support and help. Blame is counterproductive and makes the situation worse. In the long term, teaching more adaptive skills is much more effective than only reacting. Since all students with autism have difficulty understanding social interaction (although the degree may vary), this may impact on their school experience both within the classroom and in other school settings (i.e. lunchroom, playground). If this is the case, other school staff should be given appropriate interventions and strategies. Since these students are socially naive, they are vulnerable to predatory students within the school environment. If Johnny has behavioral issues, any intervention must examine possible causes arising from the features of autism. Frequently the primary focus will be on teaching appropriate behavior rather than punishment. Generic behavioral interventions are often ineffective and may inadvertently reinforce the undesired behavior. For example, time out used as a consequence may increase the behavior. Punishment focuses on the action, not the cause. It generally results in a child’s anger, disrespect, revenge or defeat. Discipline addresses the cause of the behavior and helps create a safe positive learning environment. It takes commitment and planning. We hope you find the enclosures helpful in dealing with our handicapped son more appropriately.